lesliekeating: March Giveaway : newsletter! To kick this newsletter business off, at the end of the month I'll be giving away a mystery pack of FIVE handprinted fabric panels to one lucky member of the mailing list. Sign up for the newsletter and you're already entered, easy peasy. And to further whet your appetite, I'm also going to be doing a SURPRISE shop update in the next week or so with Sample Packs, new panels and a few other treats I have up my sleeve – I will be sending a note out to the newsletter mailing list a good 12 hours before I share the update anywhere else online so if you want first dibs, sign up pronto! Great idea, I'm in! I love the close up shots of your sample packs above too. Done! 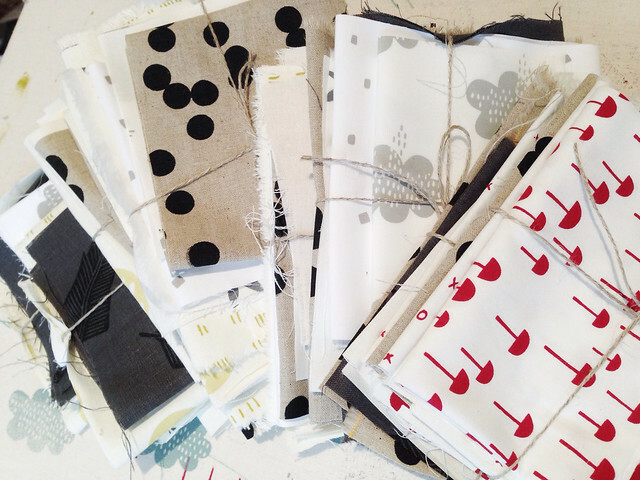 Thanks for a chance to win some gorgeous handprinted fabrics!